A fireplace can help add warmth and a relaxing atmosphere to a room. However, fireplaces are also dangerous when you do not use proper safety guidelines. Between 2005 and 2007, there were approximately 78 residential fires directly attributed to wood-burning fireplaces. 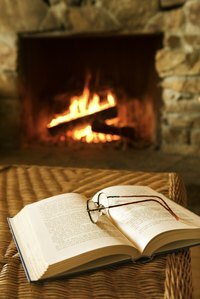 Enjoy your fireplace, but take the precautions necessary to keep yourself safe at all times. Inhabitants of homes that have a fireplace, but no carbon monoxide detectors are running the risk carbon monoxide poisoning. Sitting too close to a fireplace where the damper is not properly closed can expose you to dangerous carbon monoxide gas as it escapes from the front of the fireplace. Sitting away from the fireplace reduces direct exposure to carbon monoxide, which could save your life. If your fireplace cover is grated metal with no full glass doors, then there is always the chance that burning embers can escape the fire and land on your floor. This is why many fireplaces have a concrete or tile hearth directly in front of them. This helps to prevent the embers from getting to carpeting or wood floor while they are still burning. If you sit too close to the fireplace, those embers could land on you and start your clothing or hair on fire. When wood or synthetic logs burn in a fireplace, they release chemicals similar to those found in tobacco into the air, according to the Achool Allergy website. Along with carbon monoxide, a wood-burning fireplace also gives off nitrogen oxide and benzene, among others. Sitting to close to a fireplace exposes you directly to these carcinogens before they have the chance to dissipate into the room. One of the benefits of a fireplace is the warmth that it offers. Most people experience that warmth from the safe distance of a couch or recliner. If you sit directly in front of a fire place, you could cause surface burns not unlike sunburns to your skin. You will feel the heat immediately when you sit too close to a fireplace. The best course is to keep backing up until the heat level is comfortable.